I sat out the last few quarters of the Finish-Along, but I think it’s time to jump back in and try to get a few UFOs done done done! Here’s my way-too-long-list of proposed finishes for Q3! (I can’t show you some of them just yet, they’re still a secret). set of tea towels for me! – custom fabric printed and washed, need to cut and sew! Finally sharing my finished quilt for the 2016 Michael Miller Fabric Challenge! I love a good challenge, and this was a tough one! From the new Luxe line of 108″ wide back cottons, I received a piece of Tumble Blocks in Lagoon, as well as a Luxe solid in Luna. I adore the colors, and the fabric is so soft, with a subtle sheen. I’m a big fan of letting the fabric tell me what it wants to be. But sometimes, the fabric just doesn’t want to talk. After spending some time with it, I was feeling pretty stuck. So I decided to take a risk and deconstruct the print. I cut the fabric into the different sections of colored stripes, and was left with a pile of squares, diamonds and other odd shapes. Welcome to the point of no return. I started playing with the small cuts of fabric and… Ding! Finally! Inspiration!!! I decided to use the stripes of different shades to create the illusion of dimension and shadow. I created a paper piecing pattern, which ended up being very helpful when working with such small (and slightly slippery) pieces. It also made angling my stripes considerably easier. 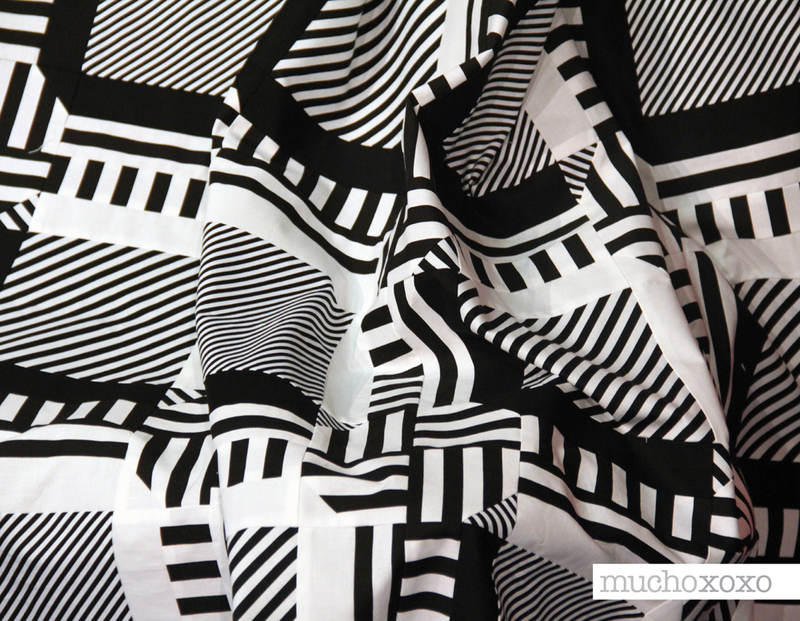 A lot of my fabric pieces were so small that I had to join them together to create a large enough piece for the block. Just call me Dr. Frankenstein. I challenged myself to only use the fabric provided (along with a coordinating Michael Miller solid from my stash), so I knew that whatever I made would be small. This bad boy comes in at a whopping 16 3/8” x 16”. So little! I made as many pyramid blocks as I could with the fabric I had, and then started playing with a layout. In the end, I decided to stack them to one side and use the solid as a background and binding. I used three coordinating shades of Aurifil 50wt for the quilting, following the angles of the HSTs. Matchstick quilting is labor-intensive, but it’s so worth it! This was the one time during this process that I was happy to have such a small quilt to work with. This was a fun exercise, and I’m pretty pleased with the final result. OH! 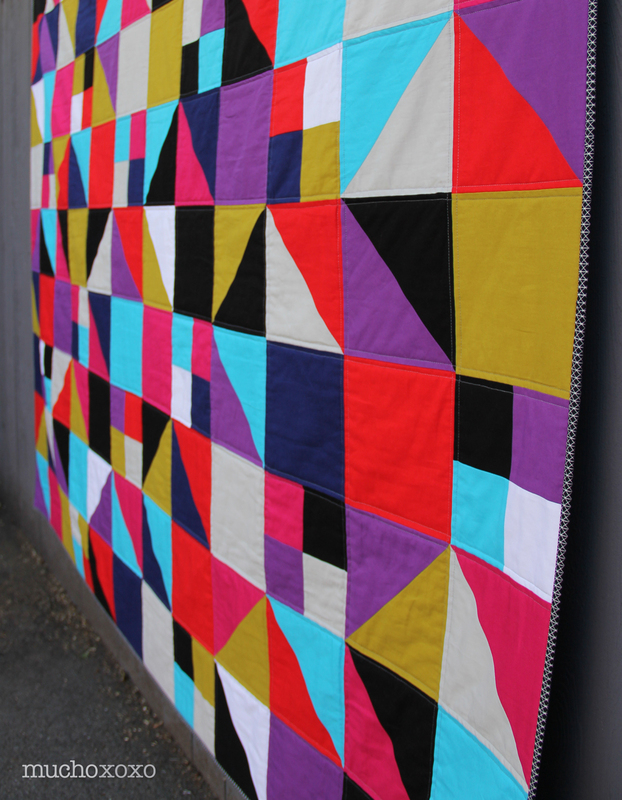 And did I mention that this quilt was accepted into QuiltCon?!?! I kind of can’t believe it. I spent a good while waiting for an email saying they had made a mistake. It’s not perfect, but I love it and I’m happy to share it with this awesome community. And I’m proud of myself for getting over the fear of entering a quilt show! 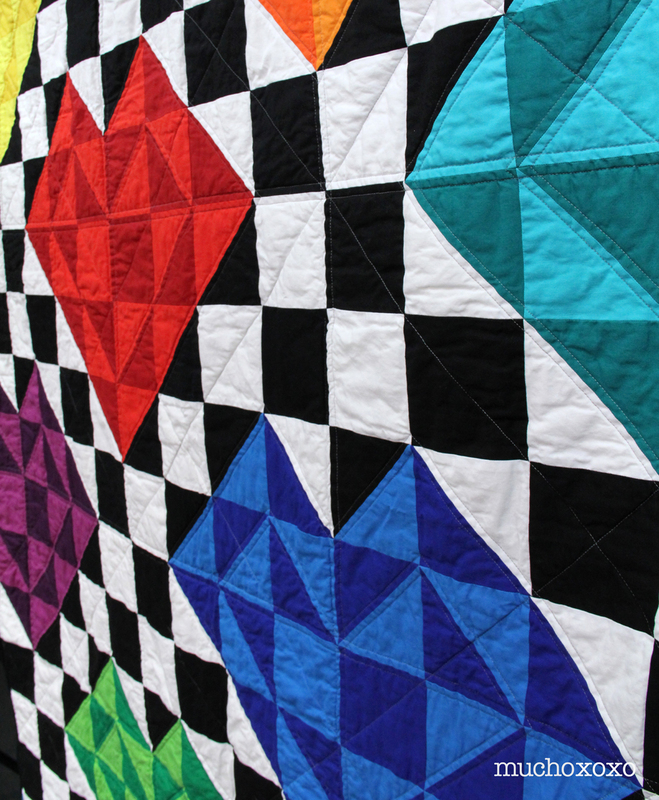 I only wish I was going to QuiltCon this year so I could see it in person. So there it is, my little blue baby. I’m thinking I may need to make a throw using this quilt block now. Well, Q3 just flew right by, didn’t it? I did manage to get one project done and crossed off my list (which is more than I can say for previous quarters). Anyway, here’s my list of proposed finishes for Q4! riley blake challenge quilt – need to add label and reattach binding. Once again, my list is a bit long. But with the holidays coming up, I’m hoping I can get most of these done so they can finally be gifts. I’ll be sharing my projects as I finish them. This year, the FAL is being hosted by nine fantastic bloggers! 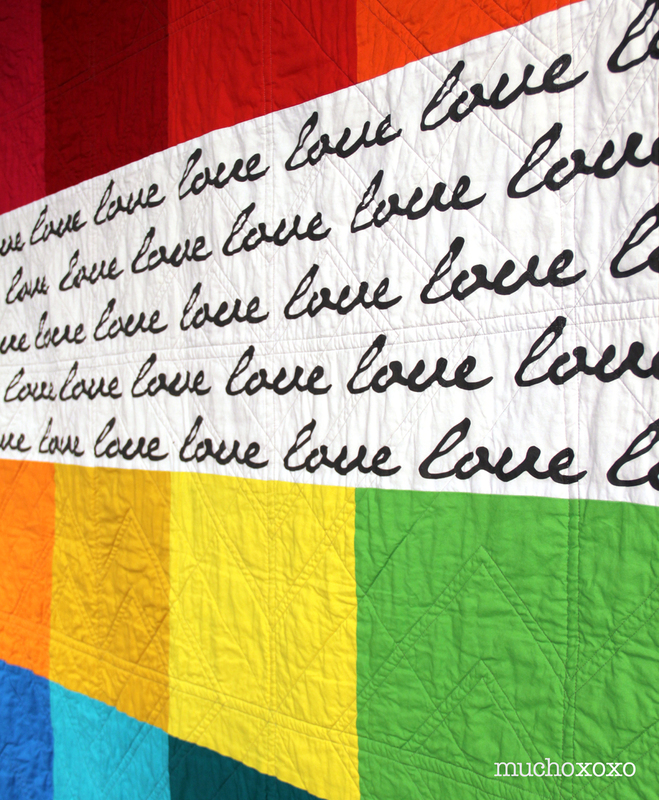 Following the horrific attack on Pulse Nightclub on June 12th, the Orlando Modern Quilt Guild put a call out to help make quilts for the survivors and victim’s families. Quilters all over the country, and many abroad, were quick to mobilize and began sewing, sending supplies, and doing everything they could to make sure they reached their goal. 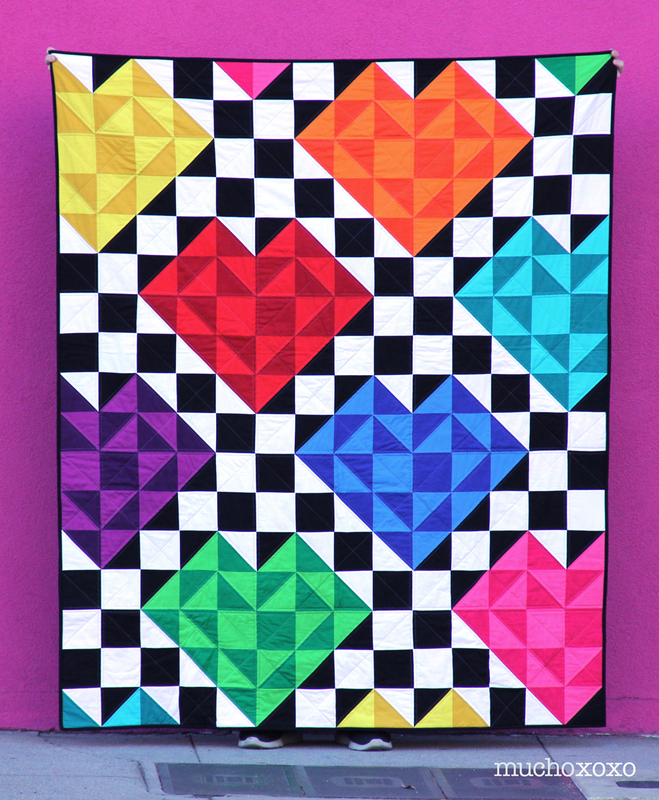 Along with the two scrappy heart blocks I made for the quilts from the LAMQG (tutorial by Crimson Tate), I knew I wanted to design and make a complete quilt. But what should it be? I grew up surrounded by love of all kinds. It was beautiful, and inspiring. And something to be celebrated. This is what I decided to focus on when I sat down to design my quilt. I wanted to create something bright and cheerful. And I wanted it to be bold, because LOVE IS LOVE IS LOVE IS LOVE! So, without further ado, here’s my finished quilt for Pulse! Something about nested or double hearts just felt right. And I couldn’t help but set them against the high contrast of a checkerboard background. I kept the back much simpler, so the quilting and focal fabric really stand out. I designed and printed the “love” fabric on Spoonflower a while ago, and I couldn’t think of a more perfect use for it. I just love how it looks surrounded by the rainbow of Kona Solids. I used my favorite grey Aurifil 50wt to quilt around each heart, as well as on a few key diagonal, horizontal and vertical points. I’m so pleased how this turned out. I’m already itching to make another one. And I’ve started writing a pattern for it, so stay tuned for that! So, there it is. 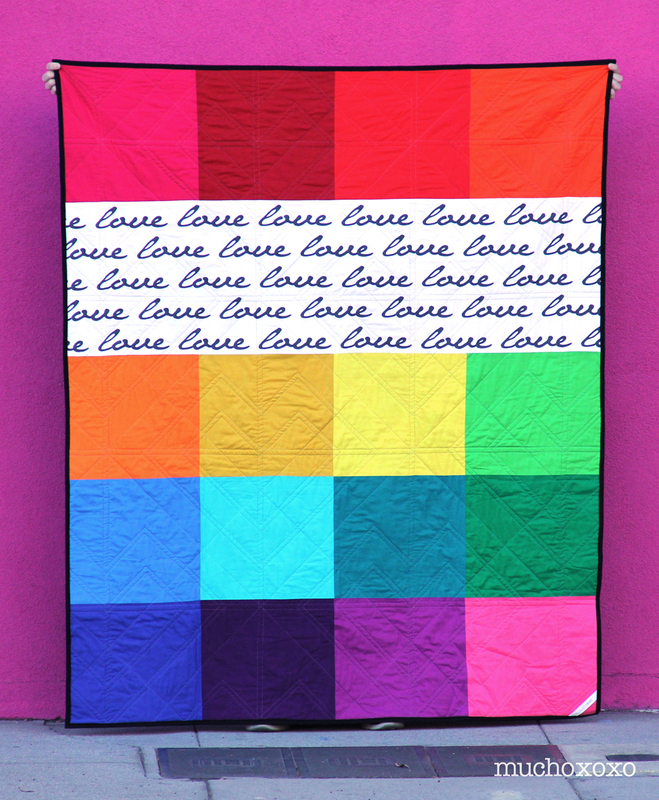 My quilt for Pulse. I hope it will bring the recipient some comfort in this difficult time. May it serve as a reminder that they are not alone, and they are loved. I’m happy to report that not only did the Orlando MQG meet their initial goal of 102 quilts, they far surpassed it. The current total is over 1,000 quilts, and more are still coming in. If you want to see what other quilters have contributed (and get a good dose of the feels), you can search #QuiltsForPulse on Instagram. Linking up with the 2016 finish-along for Q3. I finished something! Woo! Here we go again… I probably sound like a broken record, but I’m determined to get some of my WIPs done! And anyway, I like making lists. So… Here’s my proposed list of finishes for Q3! riley blake fabric challenge quilt – this was technically finished by the deadline, but I quickly realized that I wanted way more quilting. Binding has been removed (!!! ), now it’s time to add more quilting, then re-bind. 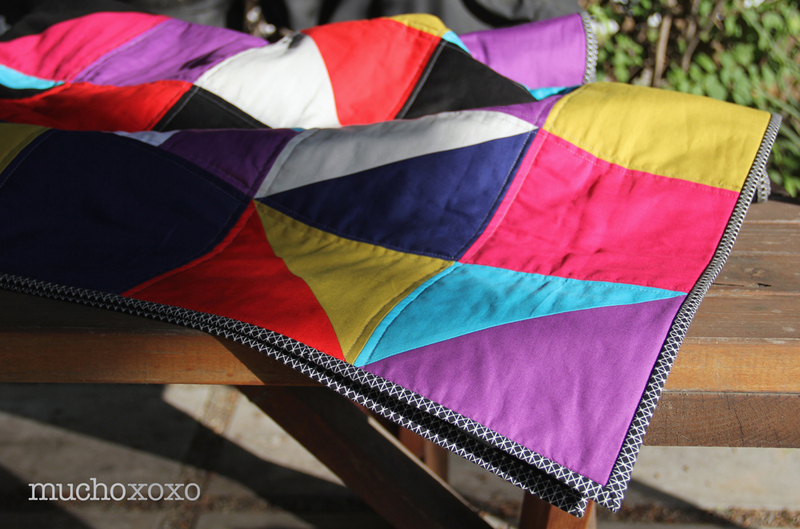 quilt for baby “Z” – have pattern and fabric, time to make it! There are many more WIPs to tackle. But these will keep me plenty busy for now. I’ll be sharing my projects as I finish them. Well, 2015 has come and gone. And yet, my pile of UFOs still sits, taunting me waiting to be finished. This time around, I’ve decided to take a slightly different approach than in previous quarters. Instead of listing every project under the sun (and inevitably overwhelming and then disappointing myself), I decided to really think about what I have to finish, and choose the 5 projects that would make me happiest to work on right now. So without further ado, here’s my list of proposed finishes for Q1 of 2016! high tea quilt – top finished, need to finish back etc. I’ll be sharing my projects as I finish them. For now, the rest of my unfinished projects will go back on the shelf so I can focus on getting these done and put to good use! This year, the FAL is being hosted by not one, but nine fantastic bloggers! 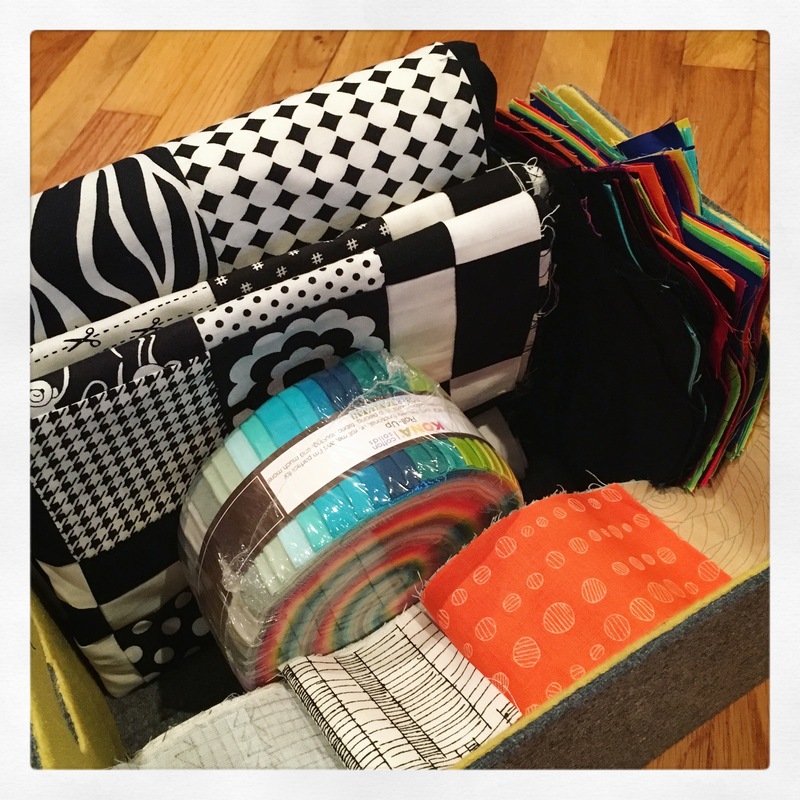 The Blogger’s Quilt Festival, hosted by Amy’s Creative Side, is in full effect, so it’s time to throw my hat quilt in the ring! 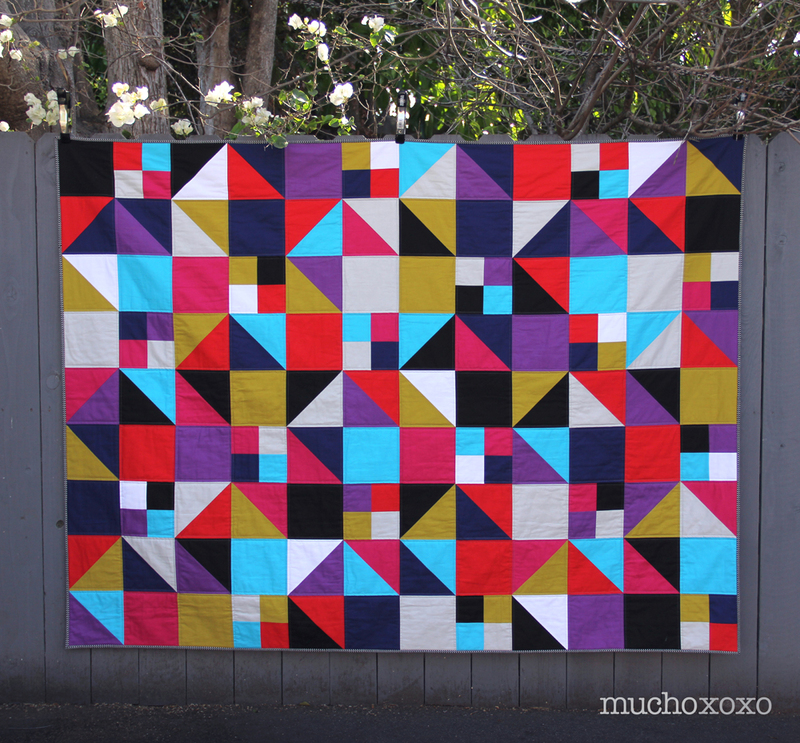 I made this quilt as part of the RJR Fabrics What Shade Are You blog hop, and it might be my favorite finish to date. I went with a combination of squares, HSTs and 4-patches to create the pattern. I’m rubbish at coming up with names, so this one is still “untitled” (like most of my quilts). Depending on how I look at it, I see open envelopes, or modern fortune cookies. The richly-colored Cotton Supreme Solids I used for the project were a delight to work with. I took all of the leftover scraps I couldn’t bear to see go to waste and did an improve panel to add some interest to the back. I think I love it as much as the front! 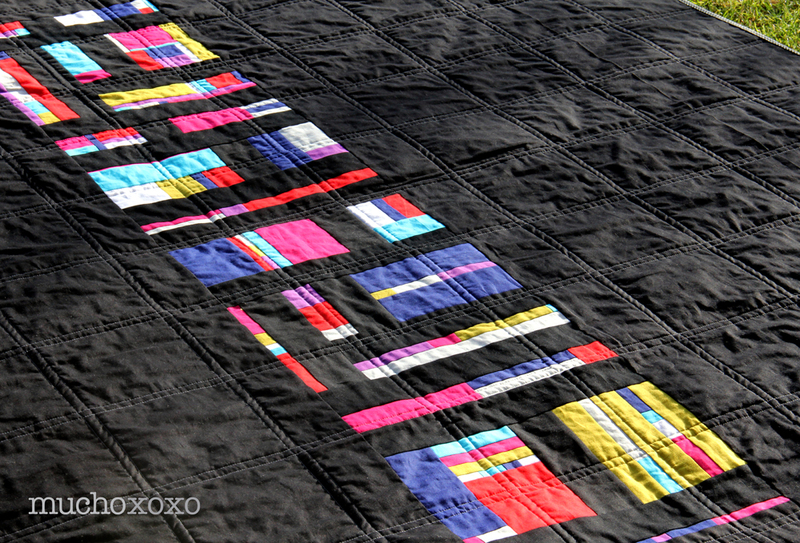 The quilt is bound with Netorious in black from Cotton + Steel and quilted with a beautiful grey Aurifil 50wt. 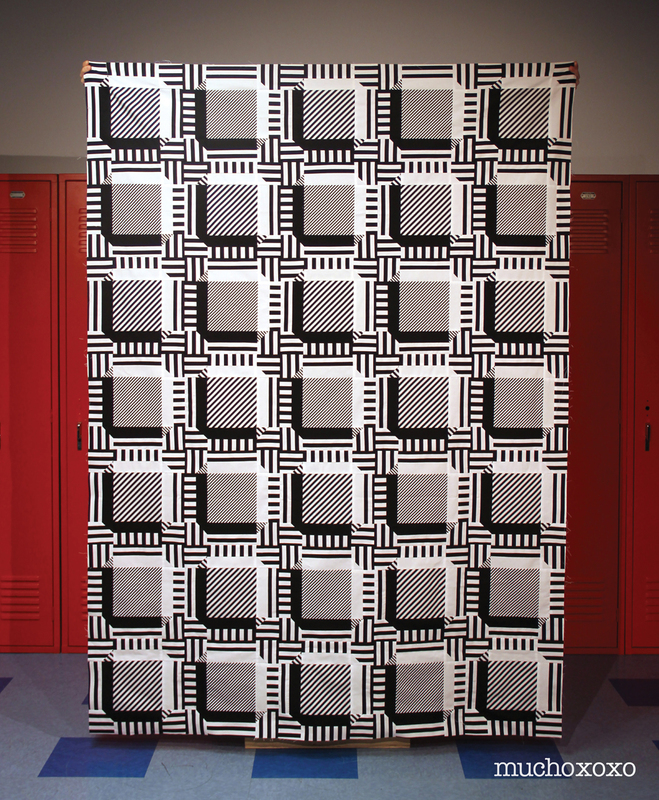 And, if you’re so inclined, you can vote for my quilt in the modern quilts category here from Oct 29 to Nov 5. You can also find all of the categories here. To say that I have been less than successful in finishing much lately is a bit of an understatement… My “sew-jo” has been way out of whack and it left me feeling pretty uninspired, and very, very stuck. Luckily, pattern testing the Cushion Cut quilt for Nightingale Quilts seemed to snap me out of my little funk and I’m feeling much more energized and motivated. Good thing, because my to-do list is overflowing! So with that, here’s my list of proposed finishes for Q4! 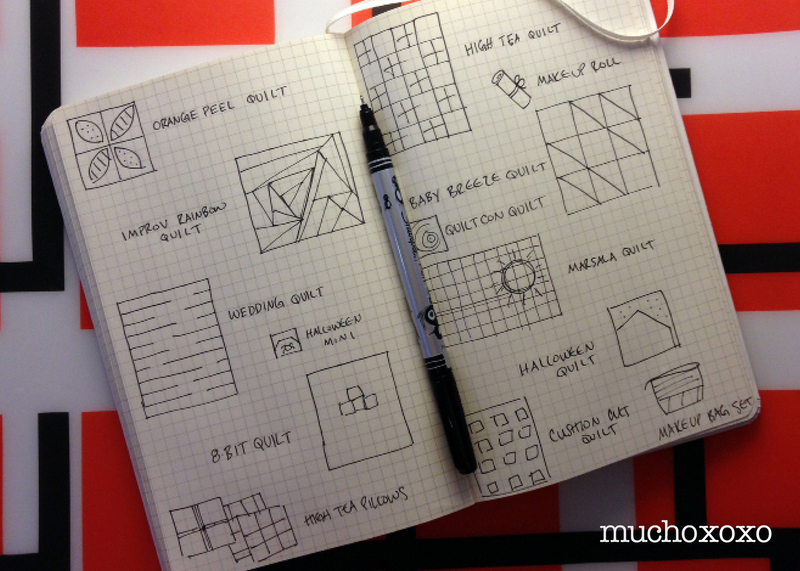 QuiltCon quilt – have a vision and the fabric, just need to execute! This list is beyond ambitious, and I don’t expect to finish everything. I’ll be very happy if I can at least make a dent. I’ll be sharing my projects as I finish them. And in the meantime, hop on over to On the Windy Side to check out everyone’s proposed finishes. You can also follow along on Instagram by searching #fal2015. Looking for some fast, fun, and easy Halloween projects? How about three! These little felt friends are quick to make, and loads of fun! These guys are equally great as decorations or toys. My nephew was particularly fond of the bat (he has crinkle material in his wings!). I love the idea of a bowl full of the candy corns as party favors. 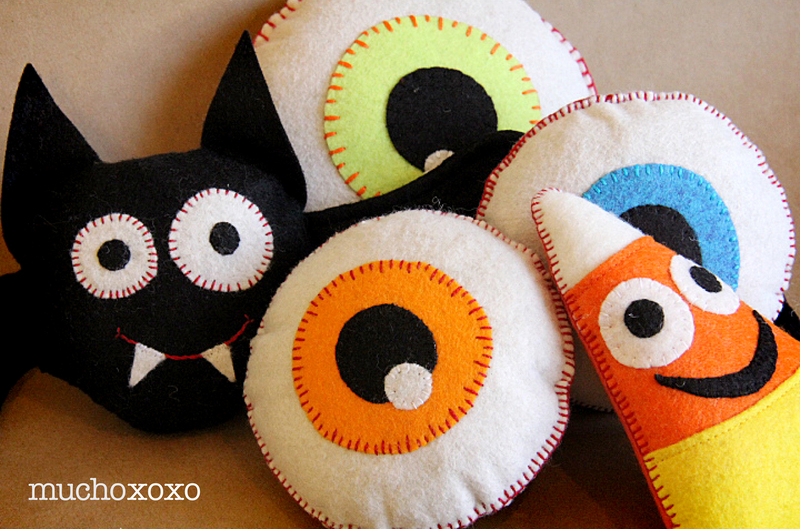 And the eyeballs are just begging to be made into a throw pillow! Really, the possibilities are endless. Ready to make your own set of Halloween friends? Follow the links below for full tutorials and patterns. 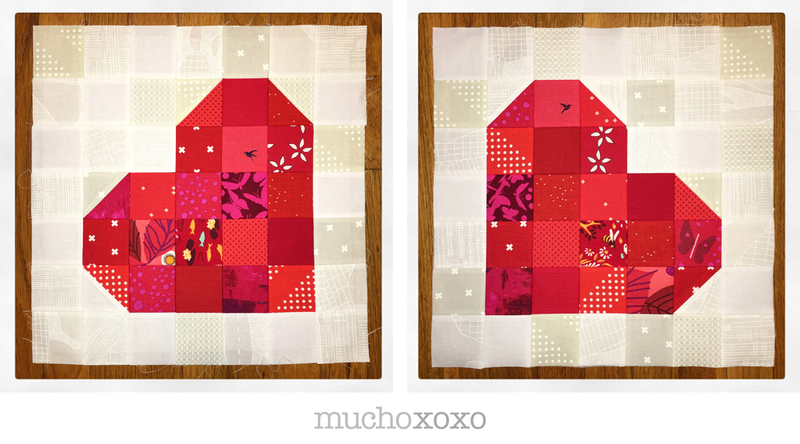 cushion cut quilt: pattern testing & a giveaway! I’m so excited that I can finally share what I’ve been working on over the past weeks! Caroline of Nightingale Quilts has just released a new quilt pattern, called Cushion Cut, and I was lucky enough to get to pattern test it. Here’s my version, in all its glory/craziness! The pattern plays with tone/value to create a fun 3D effect of a cushion cut gem. I decided to try to achieve this using only black and white. I’ve also been dying to have a go at fussy cutting stripes and this seemed like the perfect opportunity. I almost drove myself mad (not to mention blind) trying to plan this out, but it was worth it. I am completely smitten with how it turned out. It almost doesn’t look real! I love it so much, I can’t wait to finish! 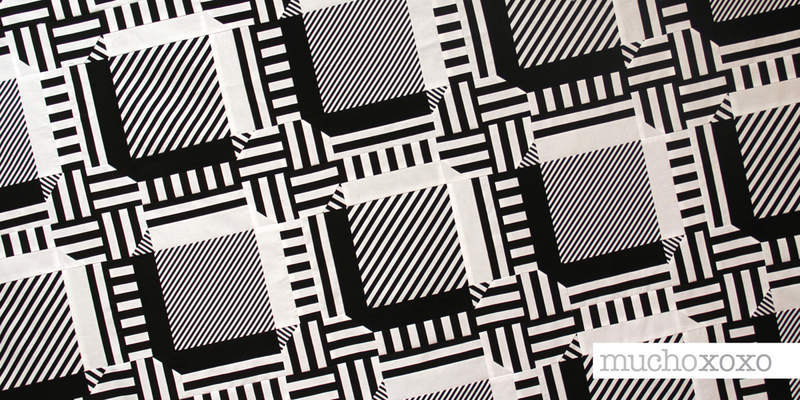 The Cushion Cut quilt pattern has all the information needed to make the quilt in 4 different sizes, from cot to king. (I made the throw size– 60”x84”). Caroline has written a fun pattern that everyone will enjoy, from confident beginners to seasoned pros. It is equally suited for solids or prints, fussy or carefree cutting. This pattern really is perfect for putting your own spin on. The possibilities are endless! 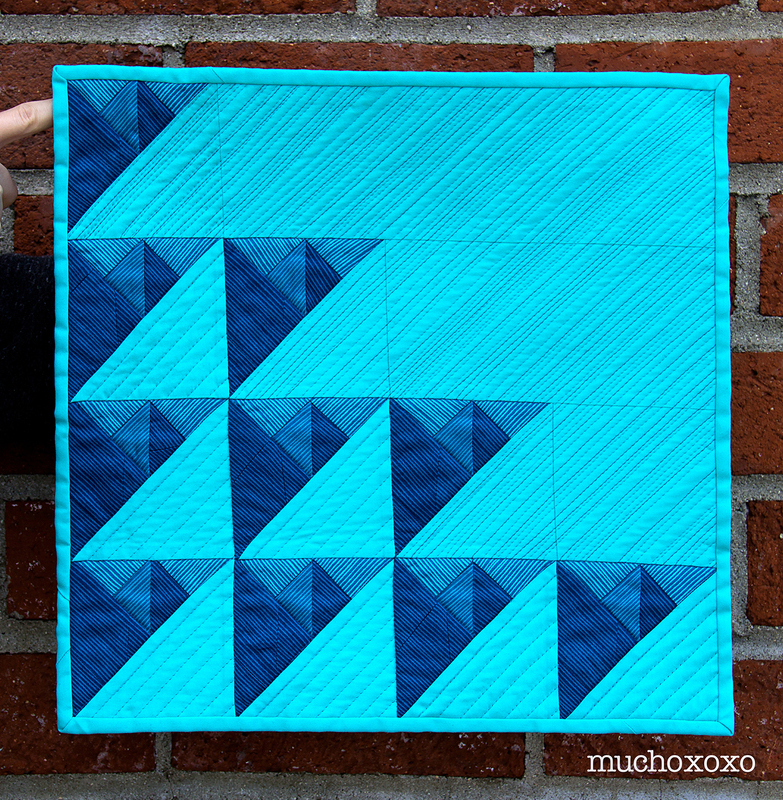 Excited to give the Cushion Cut quilt pattern a try for yourself? Caroline has generously given me the opportunity to give away a PDF copy of the pattern to one lucky winner! Leave a comment letting me know what you would make with the pattern if you win. (A gift? Something for you? 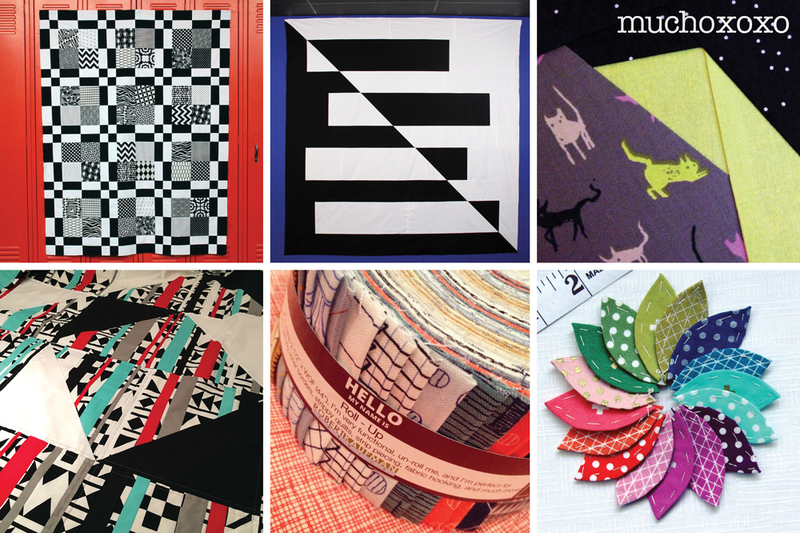 Would you use solids or pull out a coveted print from your stash?… You get the idea). Earn a second entry by following me on instagram (I’m @muchoxoxo). Just leave a separate comment that you follow (include your IG name). *The giveaway is open to everyone. Only two entries per person please. *The giveaway will remain open until Sunday, August 30th at Midnight PST. One winner will be chosen at random and announced here, as well as being notified via email, by Monday, August 31st. Congratulations to SHAYNA for being the lucky winner!!! I hope you enjoy this pattern as much as I have been! Have fun, and happy sewing! 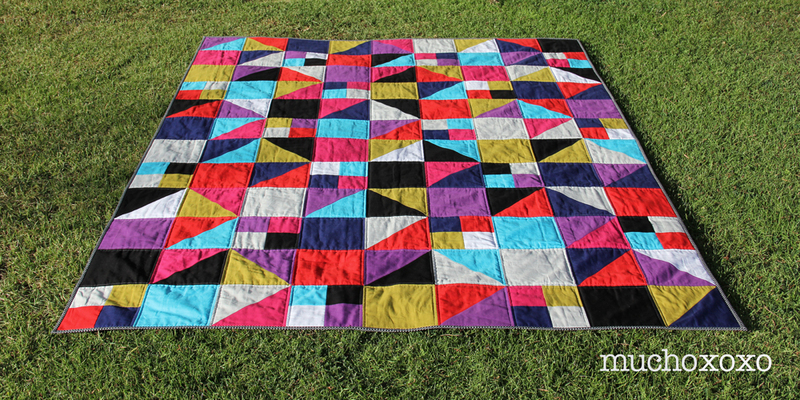 The Cushion Cut quilt pattern is available now in Nightingale Quilts’ Craftsy shop. She also has a bunch of other great patterns, check them out! A very big thank you to Caroline, and congratulations on the fantastic new pattern! I suspect we’ll be seeing many more of these soon. And if you make one, be sure to share it on Instagram and tag it #CushionCutQuilt. Have a fantastic weekend! And good luck! 2012-2013 Amanda Mourenza. All Rights Reserved. This is my original work unless otherwise indicated. If you would like to use photographs from this blog, kindly link back and give clear and proper photo credit. Please ask permission before using other content and designs. *All do-it-yourself activities involve risk. None of these projects are tested for child or infant safety. Use at your own risk, observe safety precautions, and practice common sense.